Nelly’s federal ID tattoo fits the profile of a breeder supplying several Florida research laboratories. BFP is investigating with the hope criminal charges can be brought against the guilty party or facility. No matter what though Nelly’s story underscores the danger of only knowing these animals as a series of numbers. Without names or identities, researchers or the people they gave Nelly to, felt comfortable doing otherwise despicable things. On December 3rd a concerned citizen in Florida spotted a crate off the side of a rural road. When she stopped to inspect it she found three beagles stuffed inside. All of them had been shot and were left for dead. Two were. One was still holding onto life. The terrified little beagle was scooped out of the crate and taken to the woman’s home. There they discovered her bullet-wound had luckily gone through the flappy area under her jugular, it was no longer bleeding and beginning to scab over. While examining her they also discovered that tell-tale tattoo stamped inside her right ear. A series of numbers etched in ink betraying her true origins; a research laboratory. This sweet savior knew this dog needed special help and got in touch with Beagle Freedom Project. She has been named Nelly and we have since stepped in with emergency veterinary care and a committed foster to tend to her physical and psychological needs. Her needs are great. Her veterinary inspection has revealed a history of abuse, neglect, and disease. Nelly had expensive dental work done, the vet believes she had been chewing on metal for some time like part of a cage because her bottom teeth were ground down. Most troubling was a tumor that was handing between her hind legs. A week ago she had surgery and the doctor found an additional five more. The biopsy results show she has Grade 2 Mammary Gland Carcinoma. 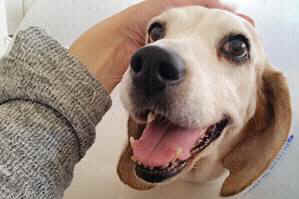 Despite it all, her years as a test-tube, her uncertain but nightmarish time after the lab, being dumped like trash on the side of the road and shot in her throat, being trapped for who knows how long with the dead bodies of those poor other beagles, and now full of drains, stints, and the growing cancer in her body - she has a contagiously excited and happy spirit. Nelly is a beagle after all. Nelly deserved better than the life she has lived and for as long she has left now Beagle Freedom Project is going to support her and we are going to tell her story to advocate for all those other dogs we cannot and could not help, like the other two dogs that died in that crate. Join us today! Make a dedicated contribution to “Nelly” so she never wants for anything ever again – and share her story and this video far and wide.